As the number of cesarean deliveries continues to increase, the incidence of placenta accreta spectrum (PAS) has also increased. This is likely due to the abnormal placenta/uterus interface caused by macro- or microscopic scar tissue from prior instrumentation or previous infection. Due to increasing incidence, it is important to be aware of the imaging findings of PAS, as well as the strengths and limitations of different imaging modalities. This review focuses on the ultrasound evaluation of PAS, evaluating the accuracy of various sonographic findings and comparing these results to other imaging modalities, particularly MRI. We explore the updated current guidelines for the imaging work up of PAS as suggested by relevant societies. Additionally, we present a brief discussion of recently introduced structured reporting templates for ultrasound reporting and statistical models to predict diagnostic accuracy for PAS. 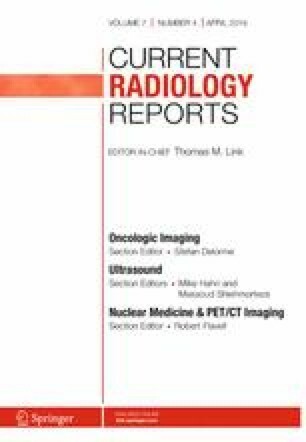 Many updates have recently been published evaluating ultrasound and MRI as screening and diagnostic tools for diagnosing PAS. This review describes and highlights many of the new developments and promising future advances. This article is part of the Topical collection on Ultrasound.